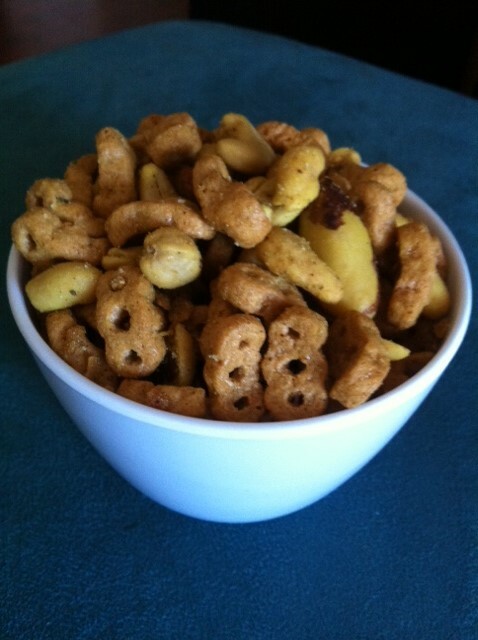 My Nanna used to make these moorish nibbly (aka Nuts & Bolts) things up for us, and for as long as I can remember there was always a bowl of them sitting on the kitchen bench. Nan’s gone now, but we’ve all carried on making Nibbles in her memory. I’ve altered her recipe slightly by spicing things up a little, and using less oil. She fried them in a deep-sided electric frypan, while I prefer to bake them for health reasons. **optional – mixed nuts and other spices of your choice, such as onion or garlic powder. In the largest mixing bowl you have, add the Nutri-Grain and nuts. Shake the soup mixes over the top, and mix through. In a separate jug, add the oil, curry powder, paprika. Stir to combine and then pour over Nutri-Grain/nut mix. Now, you need to get your hands a bit icky and work the oil mixture through, so that everything is coated as evenly as possible. Line a couple of baking trays with baking paper, and spread the mixture thinly. Bake in a very slow oven (about 120 C) for an hour, turning every 15 minutes or so with an egg lift. Cool, and store in an airtight container.